In this paper, a form of steering a swarm of robots is presented using behavior local rules that depends on four parameters. These parameters are related with a general model of the behavior of social animals called repulsion, attraction orientation and influence. 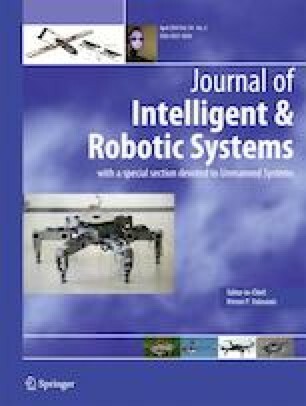 By simulations, a kinematic and dynamical math models of robots were made for testing its performance as a swarm and to know the impact of the parameters considering two tasks of location and navigation considering aggregation and flocking as a minimum condition that the swarm must have. An implementation was made building a flock of simple robots with hardware and software limitations. Some statistics to measure the performance of the swarm considering its covered area are proposed and analyze the impact of parameters on the swarm. Results of simulation are similar to the implementations as expected. The proposed behavior rules based on repulsion, attraction and orientation determine the formation of the swarm or the flock and influence emphasizes the principal task; in other words, associate a specific task with a specific perception or signal. The online version of this article ( https://doi.org/10.1007/s10846-018-0941-2) contains supplementary material, which is available to authorized users.